This post about using Etsy snippets has moved to my brand new site for creative business owners, Makery Space. I hope you’ll check it out! I don’t see the snippit or the conversation bubble on my etsy. What am I doing wrong? Lauree, I just looked into this and didn’t realize this is still just a prototype. I have edited the post with instructions of how to join the team and take advantage of this feature. Hopefully it will be Etsy-wide soon! Thank you, Melissa. Who knew? This is such a great time-saving trick. I’d say 90% of the convos I get everyday. are the same 5-10 questions. Thanks for the heads up. 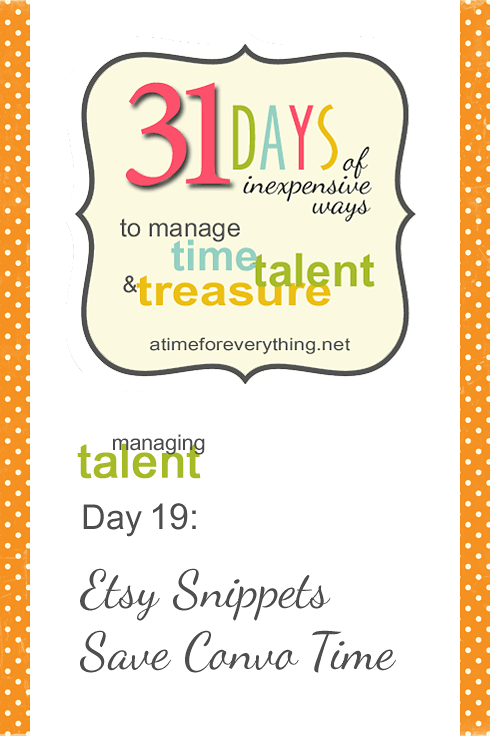 Snippets are incorporated into the latest update of the Sell on Etsy app. I love them. I’m glad I read this article, though, because I can’t edit or delete my snippets from within the app, but I was able to from the computer after I joined the prototype. So, thanks!